Stripe is an advanced payment platform for online businesses. From start-ups to Fortune 500 companies, thousands of businesses use Stripe to accept payments in over 130 currencies, from anyone in the world. 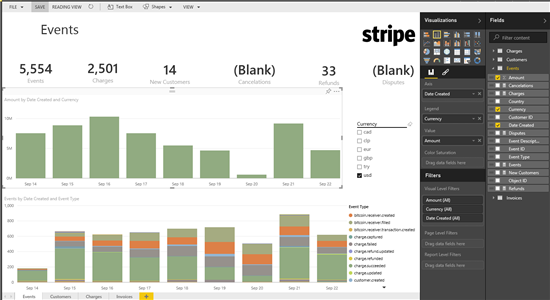 By connecting Power BI with your existing Stripe account, you’ll be able to use the Power BI Stripe content pack to monitor, explore, and visualize your Stripe activity. 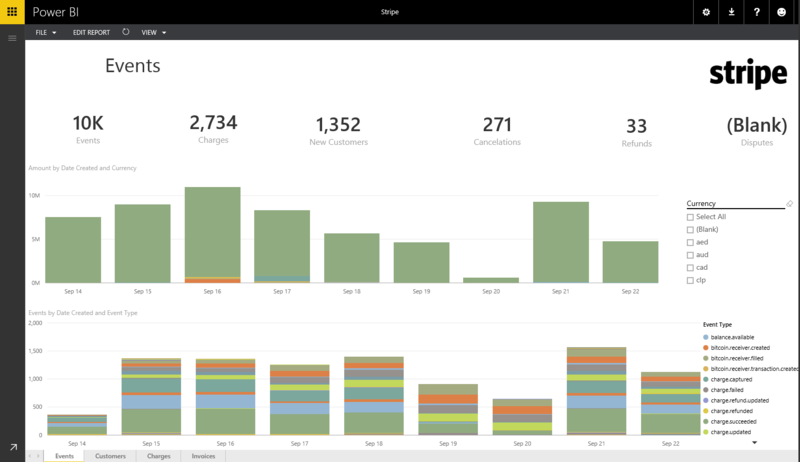 The content pack allows you to easily connect your Stripe data and begin to discover insights with the out-of-the box dashboard, reports, and curated data set on Power BI. This post will explain how the Power BI content pack can help you explore your Stripe data. 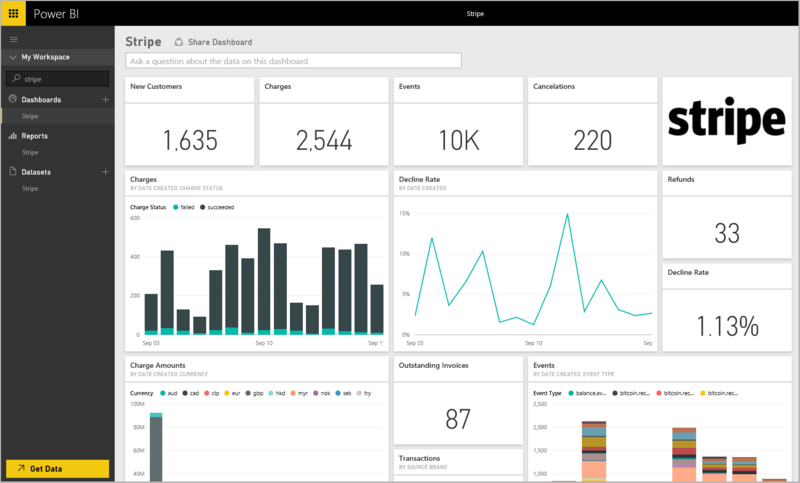 For additional details on how to get started, please see the Power BI Stripe content pack help page. After you connect to the content pack using your Stripe credentials, your data will begin loading and a dashboard will be automatically created. From the out-of-box dashboard, you have the ability to select any of the tiles and further drill into the 4 reports including Events, Charges, Customers and Invoices. For example, if you select the Events visual, it brings you to the Events report. Once you are on a report you can hover over the visualizations to see additional details. This report highlights key event summaries and insights into the volume of the various events and their monetary impact. Reports are interactive, from this report you can select a specific currency from the currency slicer to filter the data for that specific currency. Switching into Edit Report shows all the underlying tables and fields available from the curated data set, allowing you further customize your reports and dashboards. From any of the reports you can pin the visualizations or tiles to the dashboard by hovering over it and selecting the pin icon. New tiles can be added or existing tiles moved to customize your dashboard. 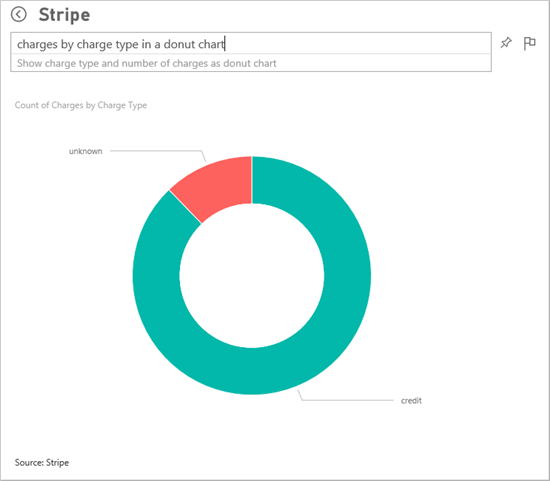 You can also try asking a question of your data, such as “total events by date” or “charges by charge type in a donut chart”. Any of the results can also be pinned to your dashboard. After the initial import, the dashboard and the reports continue to update daily. You can control the refresh schedule on the dataset. With the Power BI Stripe content pack, you have an initial set of metrics and customer insights enabling you to explore your data even further.